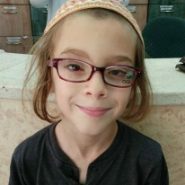 Five years ago, I shared a story with JewishMOM.com about my son, Hallel, who was born with congenital cataracts. This is an update on our situation. We integrated him into a regular kindergarten at age five. He has been working closely with a visual therapist ever since. Her job is to advocate for him and ensure that his environment is adapted to his needs, as well as help him keep up with his class educationally and socially. Last year, he started first grade at our local school, accompanied by the visual therapist and a whole team of other professionals: a classroom assistant (saya’at), a speech therapist, a remedial studies teacher, and a drama/art therapist. This year he had an occupational therapist too. He has a digital text magnifying device to use in the classroom; he doesn’t really need it to be able to see the text, but his eyes tend to get tired after focusing for a while, and the magnifier helps with that. He is also given special large-print versions of his schoolbooks. Courage, she said, because for a child who experiences space so differently from the rest of us, it is remarkable how he is fully present in it without fear; trying new things and taking risks without hesitation, facing most of his challenges head-on. Wisdom, because there is a wide consensus that the kid is very smart. Blessing, because she found that he was blessed with the character traits and abilities that serve him well in helping him overcome his challenges. At the end of the conversation, she also said that she can tell he has received a lot of attention and support throughout the years. It made me think of that sense of purpose I had years ago when I realized that his soul had “chosen” us to be his parents, and how humbled I was by that. It was hard to keep my eyes dry in that meeting. A few weeks later, Hallel gave a presentation to his whole class about his visual impairment, with the help and support of his visual therapist. She brought some goggles that simulate visual impairment and had some of his classmates try them out to put themselves in his shoes. It was a really important experience for him, and I think it really helped his classmates understand his condition better. A couple months after that, we had an appointment with the eye doctor. She said that it is no longer clear that the risks of implanting artificial lenses outweigh the benefits, and that we might want to think about doing the surgery. It wasn’t exactly an enthusiastic recommendation, and she said she couldn’t guarantee it would really improve his vision all that much. She left the decision up to us. So he had the surgeries (one in each eye) almost exactly a year ago. They didn’t go as smoothly as his previous surgeries had; after the first one he had such severe pain we rushed him back to the hospital, only to discover it was because his eye was open under the bandage and the gauze was touching his eye! As soon as the bandage came off he felt perfectly fine–and was delighted by his new, improved vision. He was running around looking at things all afternoon and babbling excitedly about his next surgery! After the second surgery, he had more pain, even when we removed the bandage. It turned out to be elevated pressure in the eye, a common complication after cataract surgery. But with some medication, the situation improved, and the vision in that eye slowly became clearer as well. Hallel has no regrets, and it’s clear that the surgeries have improved his quality of life. His glasses prescription went down from +17 or so, to +0.25 in one eye and -2.5 in the other! He just graduated second grade. He still struggles to keep up with reading, and being a quirky, intelligent, and sensitive kid, he sometimes struggles socially, too. But I feel grateful and blessed to be where we are now, and I am humbled to be Hallel’s parent. 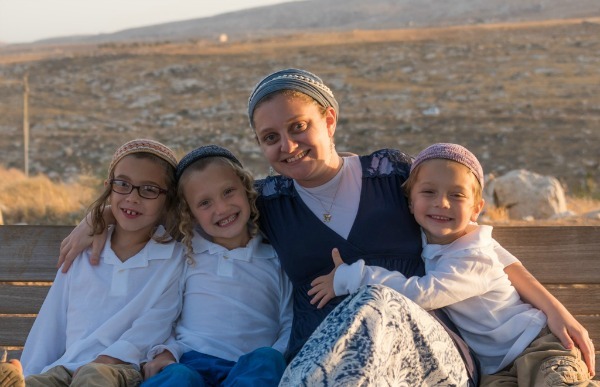 Daniella Levy is a mother of three, rabbi’s wife, writer, translator, self-defense instructor, bridal counselor, black belt in karate, and certified medical clown–and she still can’t decide what to be when she grows up. Her debut novel, By Light of Hidden Candles, is now available for pre-order from Kasva Press in advance of its October release. She is also the author of Letters to Josep: An Introduction to Judaism. She blogs about Judaism and life in Israel at LetterstoJosep.com, and about resilience in the face of rejection for artists and writers at RejectionSurvivalGuide.wordpress.com. Learn more about her at Daniella-Levy.com. Your update was very encouraging and inspirational and gives me strength to continue with my own particular challenges. May you be continue to be blessed by Hashem. Thanks so much for the update. I am so happy for Hallel! What an extraordinary transformation. He was so right to choose that surgery, and so right to choose you to be his Mommy. My daughter (now 10) went to Gan Elia when it was (still is?) a mixed gan- for kids with visual impairs, some of them were blind, and “normative” kids. My daughter did not have visual impairs. I don’t know who benefited more from this co-ed arrangements- my daughter (and us as parents) or her visually impaired friends! Yasher koach to you, Daniella, for everything you’ve done for your kid(s). And it’s refreshing to hear every once in a while that along the way there are still such revealed miracles in the world. I enjoyed hearing about Hallel’s progress. But I am really inspired by your description of his mom at the end! I am going to check out her website!